Written by two authors, each writing from a different character's point of view. Rashad is beaten up by a cop who accuses him of stealing. The beating puts him in hospital and film footage appears on TV. The other character is Quinn, who witnesses the attack, and is friends with the younger brother of the cop doing the beating. This event divides the local school and community which we see through the eyes of these two characters. 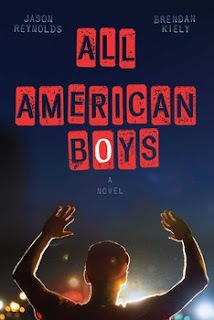 There are great male characters, and a thorough exploration of all the issues involved, with the bonus of great depictions of basketball training. It also reminded me of that great award winner from last year The Crossover by Kwame Alexander. It took a little while to hook me in but once I got to know the boys and who fitted in where I was hooked. We read a lot about racism in the past, but this book is about now, when racism is still alive and well, and fuel for police brutality. I liked the way the main protagonists came to look at events from other points of view, and were prepared to change as a result of their understanding. 12+.